The term "Second World" refers to the former communist-socialist, industrial states, the territory and sphere of influence of the Union of Soviet Socialists Republic (Soviet Union). Communist Yugoslavia was the only eastern European country which was not aligned with the Soviet Union. The Commonwealth of Independent States (CIS; Russian: Содружество Независимых Государств, СНГ), sometimes also called the Russian Commonwealth, is the loose association of former Soviet Republics, set up during the breakup of the Soviet Union. The organization was founded on 8 December 1991 by the Republic of Belarus, the Russian Federation, and Ukraine. The creation of CIS was the attempt to form a successor entity to the Soviet Union, which was in the process of disintegrating. The founding members announced that the new alliance would be open to all former republics of the Soviet Union, and to other nations sharing the same goals. On 21 December 1991, eight additional former Soviet Republics – Armenia, Azerbaijan, Kazakhstan, Kyrgyzstan, Moldova, Turkmenistan, Tajikistan, and Uzbekistan, joined the CIS. 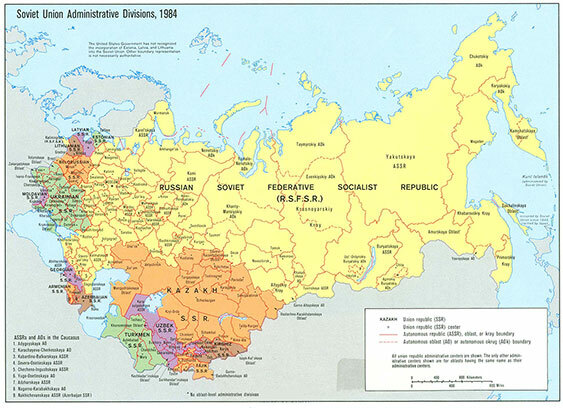 Soviet Union administrative divisions in 1984. * Albania broke Soviet influence in the 1960s and aligned itself with China. ** The forcible annexation of Estonia, Latvia and Lithuania into the Soviet Union in 1940 was considered illegal by the United States and most Western European democracies and the three nations were de jure not considered parts of the Soviet Union. **** Today Mongolia is a parliamentary republic. Comparative study of post-communist nations in transit to democracy. Maps of Countries of the "Second World"